No significant investment required. Great design and rich functionality. Quick launch under your brand. We transfer the source code and copyright. There are no restrictions on modifications. Find out more in 60 seconds video! Our application builder has everything to launch your branded mobile iPhone & Android applications in a matter of days. We have transferred our rich experience in creating mobile applications for large companies and offer you the widest possible functionality. 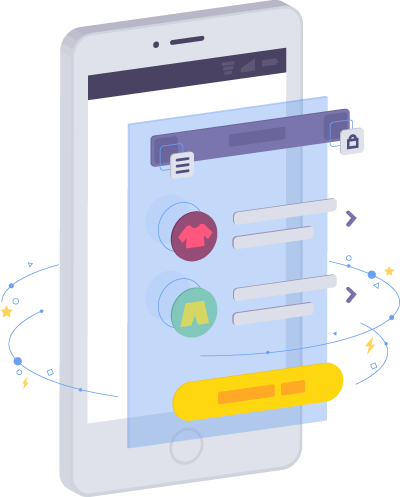 A catalog of goods or services, a shopping cart, a full-featured product map, news, and promotions, push notifications, Apple iBeacon support and much more is available immediately! Block of choosing items by parameters: size, color, brand, clothing material, etc. Parameters for the goods: size, color, brand, material, etc. Support for leading payment systems: PayPal, etc. Gathering analytics about the moving of users between your stores. We did not forget anything? The applications are already on the smartphone. The speed of work is impressive! You are not limited by functionality and the great design. What is suitable for starting a business can be easily developed as you want. Any improvements are possible immediately or later, as you wish. We transfer the source code of mobile applications with documentation, which allows us to involve third-party developers for any improvements. You do not depend on us, develop your product as you prefer! The constructor is developed on the Microsoft Xamarin platform.